The Loxley Homes development features one town house and six luxury three-bedroomed apartments for those looking to live in pure opulence with spacious living areas – whether it be couples or families. 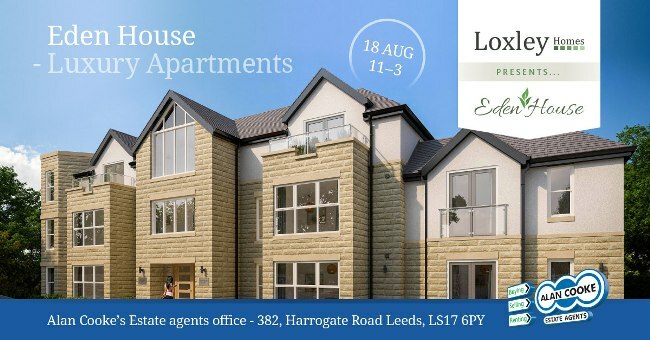 The Open Day will be taking place on Saturday, August 18, at Alan Cooke Estate Agents – 382 Harrogate Road, Moortown, Leeds, LS17 6PY from 11am until 3pm. Tim Dodkin, development director for Loxley Homes, said: “We hope to see lots of people at the open day at Alan Cookes Estate Agents, it will be the perfect opportunity for those pondering the idea of apartment living – to ask our sales team lots of questions, view the floor plans and immerse themselves into what it would be like to live on a beautiful development like Eden House. The high-spec apartments come in a choice of four different floor plans ranging from 1414sqft to 2,084sqft and will include contemporary Remo Porcelain kitchens, beautiful bathrooms by Villeroy and Boch along with landscaped gardens, maintained communal access and high-tech security systems. Some of the apartments also include spacious roof terraces to be able to dine alfresco or just enjoy the evening sunsets.